These guys are legendary. 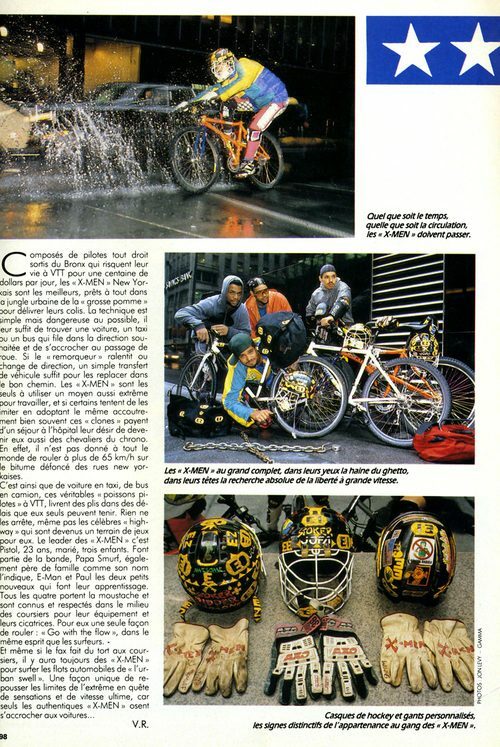 The X Men were a group of messengers who rode mountain bikes around NYC in the early 90’s. 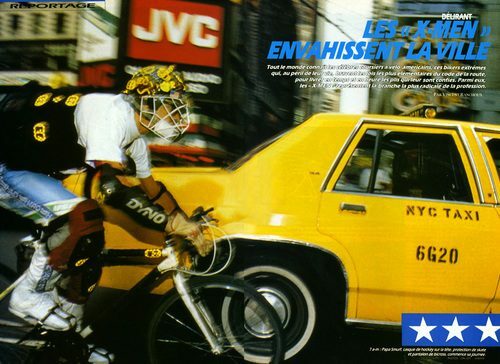 They became infamous in NYC as they tore through the streets, skitching on cabs and buses. Their predecessor, by almost 12 years, Joey Joe, went on to influence the messenger comic, Messenger 29, in the late 90’s and sculpted the X Men persona. I just came across these magazine clippings on the X Men and thought I’d post them. Also check out the bootleg Youtube clip that documented their riding through the streets and parks of NYC. Check out Joey’s skitch at the 4:40 mark along with a pretty great strings of quotes that are best to be heard from the man himself. Definitely watch this if you haven’t seen it already. These scans are awesome. Great photos.